As track days go, our April one on Sunday 19th was a classic. It had everything, great cars, great drivers, great weather, great track and great, enthusiastic spectators! The scene was set when, upon arrival, I saw that the Breezemount Motorsport race truck was already in place at the paddock garages. That meant that Philip Shields had brought more than one car. 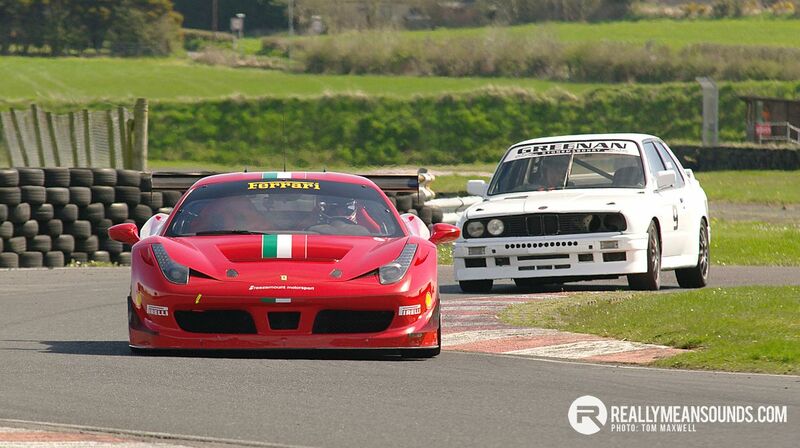 In fact, he had brought one of his 458 Ferraris and his ex-BTCC Vauxhall Vectra. To cap that, Philip arrived in his LaFerrari, the only one in Ireland and it remained on display, beside the truck, all day. Tony Greenan made a very welcome return in his Bonda and I burst out laughing when the initial session got under way with Philip away first and Tony on a mission, right behind him. The two of them just pulled away from everyone else at a massive rate. In that same session was Nicholas Wood, who was experimenting with a new brand of rubber. After this session, he was very concerned as he felt that his Hondus was slipping all over the place. However, after his second session, it was behaving much better, as the tyres scrubbed and by his third session he was going much quicker than he had ever done before, to the tune of around two seconds! Roy and Paul Stewart and Desi McGlade were out in their Kirkistown Fiestas and were very entertaining to watch. Later in the afternoon they were joined by safety marshal, Conor Mulholland and Team Trackskills pilot Eórann O’Neill, in similar machinery. Eórann has acquired her Fiesta from Megan Campbell in a deal which has resulted in Megan taking ownership of Eórann’s much-loved Ginetta Junior machine. Megan had her first run in it in the afternoon and went very well. Rooth Cousins also made her debut in her dad’s East Engineering MX5. Already an accomplished horse-woman, she enjoyed herself so much that she now wants to go racing! It is great to see the girls staking their claims to a piece of trackday action and we would love to see this trend increase. Another returnee was enthusiastic Newcastle United supporter, Leslie Graham, in his “Toon” Toyota MR2. After the first session he was threatening to burn it as he was suffering overheating problems, after spending nearly a grand on engine repairs! However, a slipped hose was the problem and a big jubilee clip was the solution. By the end of the day Leslie had a grin from ear to ear. You would have thought Newcastle United had beaten Sunderland, ten-nil! Father and son team, Arnold and Andrew Gibson brought their BMW 5 Series back and were scorching round, despite some tracking problems. The Street Racer team of Andrew Armstrong (BMW) and Aidan Vance (Supercharged Civic) entertained the spectators throughout the day. The acceleration of Aidan’s Civic is amazing, although he was having some overheating issues. With having great weather during the days leading up to Sunday, the soft-top guys were out in force. Richard and Chris Kyle were going well in their Westfield before mechanical gremlins brought their afternoon to an early halt. Richard Munnis was giving his Stryker its debut, having moved away from the bike engine counterparts. Michael Campbell went very well in his aerodynamic Reiss Hayabusa. Rob Gallagher had the odd mechanical hic-cup in his orange Westfield while Andy Parkinson’s MK Indy seemed to be trouble free. Steven Whyte, Larry Mawhinney and Richard Kee completed the Locaterfield Brigade, going well in two Westfields and a Locost, respectively. For the first time, Derek Le Mathew’s Puma had another one to play with as David Watters returned with a red version. 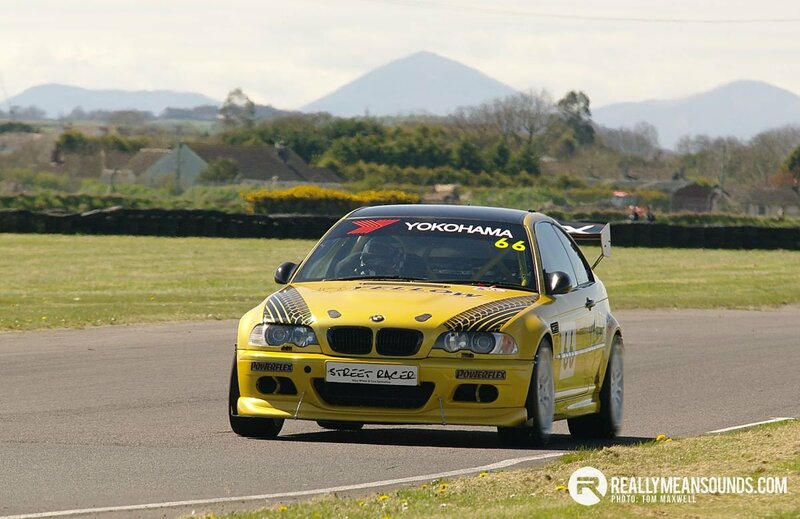 These cars go really well round Kirkistown. Newcomer, Keith Hannafin, went very quickly in his Civic. It would be no surprise to see him on the grid in future saloon races. The most unfortunate story of the day was the crash at the Chicane involving Brendan Cumiskey’s beautifully prepared Mini Clubman 1330. Brendan drives the wheels off this car and it is great to be able to see such a rare machine being used properly. However, this time the Chicane bit back and the side panels took a hammering. Brendan was not hurt and the car drove back to the paddock. The final session of the day was almost full, including the Cosgrove brothers who were travelling back to Dundalk and the Harron brothers who had even further to go. In fact, their father asked us to black flag them before the end of the session so that they could get packed up to go home! That says it all really. Tremendous fun was had by all. Thanks go to St John’s as always and to all of the marshals, who had already had a busy weekend at the previous day’s Croft Hillclimb. Our next date is Sunday 24th May and bookings are being taken. Another great day , fine weather and fine cars ,la Ferrari is awesome especially when moving , tremendous roadpresence ! also great to see the 458 and the Vectra ,interesting to look around . Some very fast race cars there today supercharged civic was unreal in the way it could accelerate , didn't get a run out with @evo98 as he had a misfire and we had a balljoint on the way out but it held out to the end , and strangely some of the balance that has been missing was starting to come back. | M3 on trailer, usual rush ,still haven't got geometry set but will see how it goes , loads of understeer the last day so hope we can get it sorted. Anyway good day forecast and a possible run out with @evo98 , could be a memorable one ! Not hearing from @OS Ken or @ jim 28 where are you guys? I know we have not been about between putting the pennies into the motors and working new crazy shifts but that will be changing soon and we will be back.Missing Kirker bigtime. No no, wasn't down in the ST, came down in a friends Megane 225. Saw a blue ST sitting there though, beside a puma, so I take it you where in the red puma?? Both puma's where going superb. Actually loved the battles between the fiesta's, was great entertainment them following so closely for so many laps.